The homeobox genes are a group of genes containing homeobox (a 180 base pairs long DNA sequence) and encode homeodomain proteins that act as transcription factors . Many homeobox genes have been proved to be implicated in various human cancers, acting as oncogenes or tumor suppressors [6–8]. Paired-like homeodomain transcription factor 2 (PITX2), a member of the bicoid/paired-like homeobox gene family, is located on chromosome 4q25 and encodes a transcription factor involved in the development of anterior structures [9, 10]. Recent studies have highlighted the association of PITX2 with progression of many human cancers, including gonadotroph tumor, colorectal cancer, thyroid cancer and esophageal squamous cell carcinoma [11–14]. However, the expression of PITX2 in LUAD and its effect on biological behavior of LUAD have not been elucidated. Earlier researches have discovered that homeobox genes are actively involved in the regulation of the Wnt pathway [15–17]. 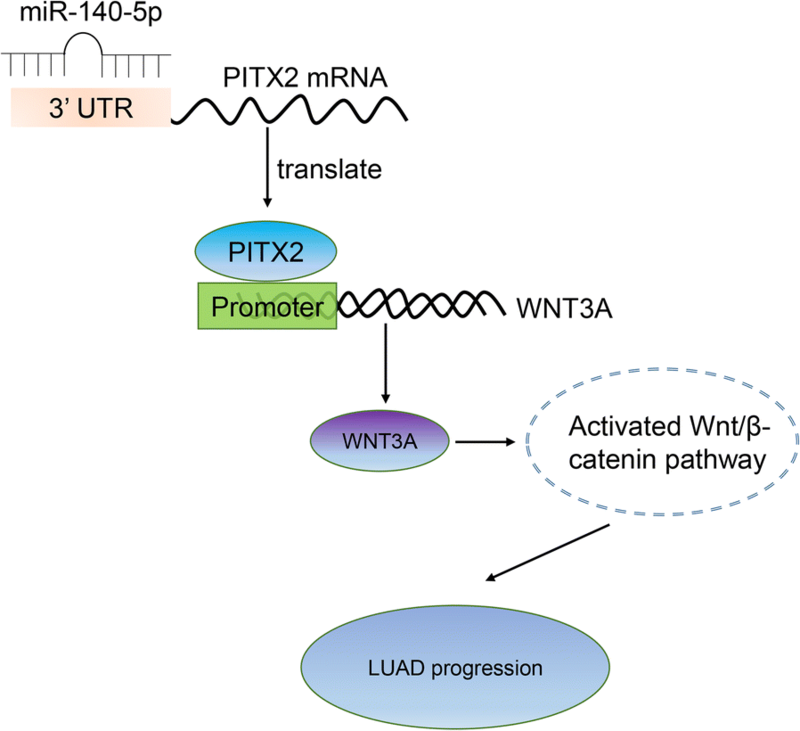 Particularly, PITX2 is reported to regulate the Wnt/β-catenin pathway by activating Wnt ligand genes and thus contributing to cancer progression . The Wnt/β-catenin signaling pathway was first identified for its role in carcinogenesis and meanwhile it was confirmed to be essential for embryonic development [19, 20]. Herein we investigated the influence of PITX2 on activity of Wnt/β-catenin pathway in LUAD. MiRNAs, a class of 18–25 nucleotide non-coding RNAs, have emerged as key regulators of gene expression at the post-translational level by combining with the 3′UTRs (untranslated regions) of their target mRNAs . The miRNA-mediated gene post-transcriptional regulation is involved in various aspects of physiological processes . And studies are increasingly implicating miRNAs in the progression of many types of cancer, including LUAD [23–25]. Since the regulatory miRNAs could suppress target mRNAs and play a critical role in pathogenesis, we performed experiments to determine whether PITX2 is targeted by specific miRNA. It has been confirmed that the encoded protein of PITX2 acts as a transcription factor to regulate gene expression. As shown by Animal TF DataBase, the TF binding site of PITX2 was presented (Fig. 4a). WNT3A, one of the most important ligands in canonical Wnt/β-catenin signaling pathway, has been well established in the progression of LUAD [39–41]. 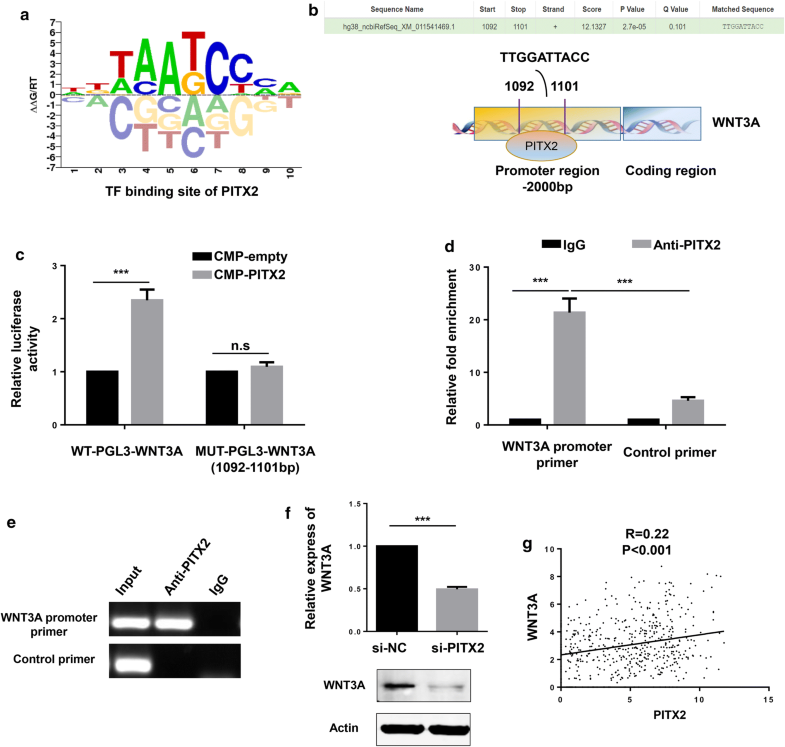 Predicted by hTFtarget website, PITX2 potentially targets the promoter region (1092–1101 bp) of WNT3A (Fig. 4b). Then we constructed luciferase reporter plasmids carrying WNT3A promoter (wild type and mutant type), and luciferase reporter assay revealed that PITX2 increased wild type but not mutant WNT3A promoter luciferase activity (Fig. 4c). Moreover, the results of ChIP assay suggested that PITX2 directly targeted the promoter region of WNT3A (Fig. 4d, e). In NCIH1299 cell lines, knockdown of PITX2 suppressed the expression of WNT3A (Fig. 4f). And in TCGA dataset, PITX2 had a positive correlation with WNT3A (R = 0.22, p < 0.001) (Fig. 4g). These findings indicated that PITX2 controlled the activity of Wnt/β-catenin signaling pathway via transcriptional regulating WNT3A. The progression of cancer is closely linked to activation of oncogenes and inactivation of tumor suppressor genes [42–44]. 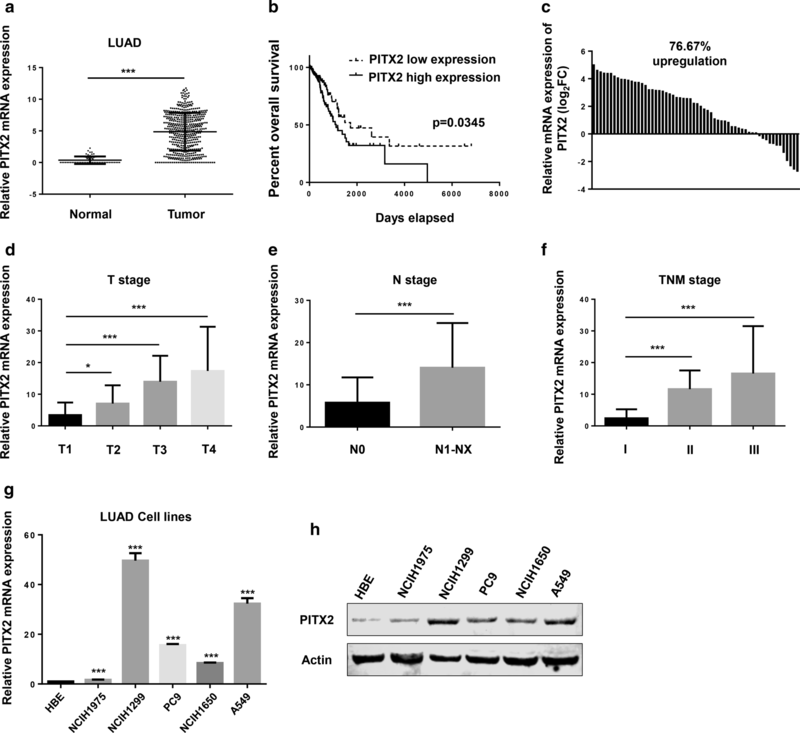 LUAD is the most predominant histological subtype of lung cancer and multiple genomic alterations function in cancer growth [45, 46]. The best known is that approximately 15–20% of LUAD harbor epidermal growth factor receptor (EGFR) mutations . However, the functional impact of most genomic alterations of LUAD remains largely unknown. To better understand novel functional genomic alterations in LUAD is hopefully to provide new treatment targets for LUAD patients. As a member of homeobox gene, PITX2 plays a role in the terminal differentiation of somatotroph and lactotroph cell phenotypes , is involved in the development of the eye , tooth and abdominal organs , and acts as a transcriptional regulator involved in basal and hormone-regulated activity of prolactin . Recently, more and more studies show the critical role of PITX2 in many kinds of cancers. In breast cancer cells, upregulation of PITX2 promotes letrozole resistance via transcriptional activation of IFITM1 signaling . The PITX2 DNA methylation was confirmed as a biomarker for the risk and prognosis of colorectal carcinoma , head and neck squamous cell carcinoma , urothelial bladder cancer  and prostate cancer . Increasing researches are showing the significance of development-related genes in cancer progression. KDM5B, a critical regulator during early embryonic development, plays a critical role in controlling stem cell function and tumorigenesis . GREM1, a member of antagonist family that has been shown to relay the sonic hedgehog (SHH) signal from the polarizing region to the apical ectodermal ridge during limb bud outgrowth in mouse, is involved progression of various cancers [58–60]. Similarly, we identified the oncogenic role of PITX2 in LUAD. In aspect of mechanism, we found that PITX2 promoted LUAD progression as least partially by activating Wnt/β-catenin pathway. Wnt/β-catenin pathway causes an accumulation of β-catenin in the cytoplasm and its eventual translocation into the nucleus to act as a transcriptional coactivator of transcription factors that belong to the TCF/LEF family . 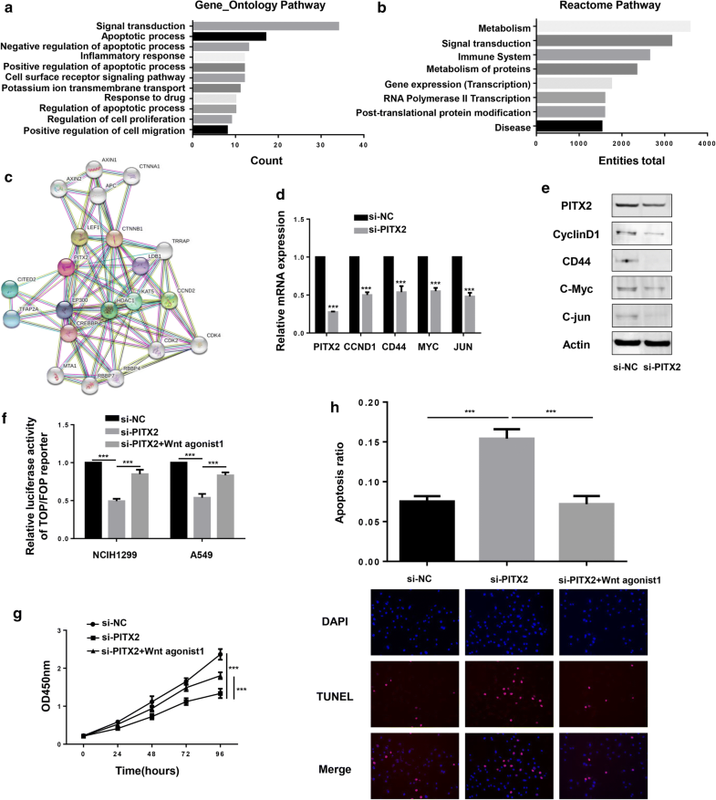 Wnt/β-catenin pathway is involved in virtually every aspect of embryonic development and also controls homeostatic self-renewal in a number of adult tissues . Epigenetic dysregulation of Wnt/β-catenin pathway plays a significant role in the pathogenesis of several human cancers [63–65]. The targeting of Wnt protein to the plasma membrane and the binding to its receptor are the initiation process of activating Wnt/β-catenin pathway . 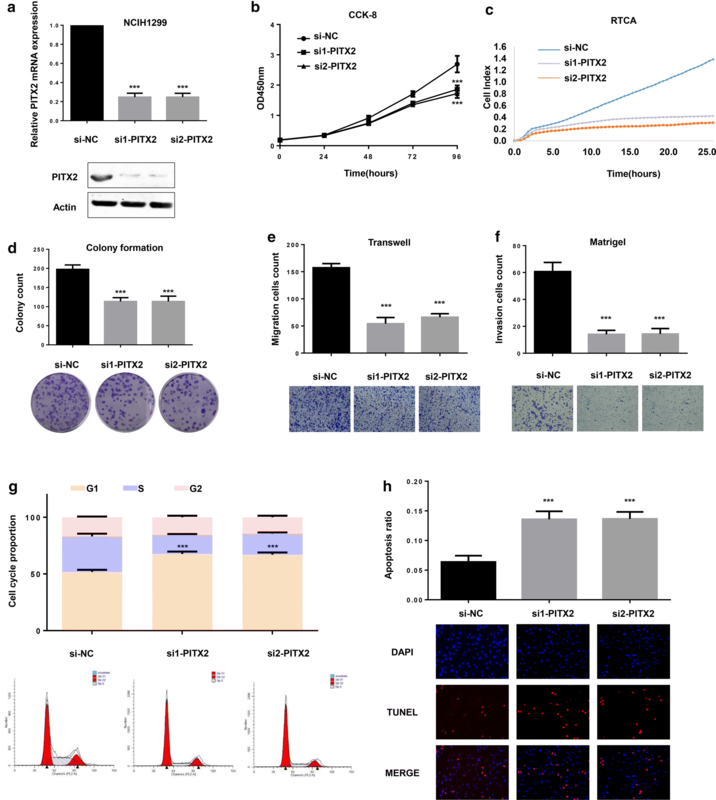 As an important member of WNT gene family, WNT3A enhances β-catenin-dependent transcription through GSK3β inhibition or direct β-catenin phosphorylation at Ser552 . WNT3A has been reported to promote the migration and invasion process of LUAD and impact prognosis of LUAD patients . And our results suggested that PITX2 directly bound to the promoter region of WNT3A and enhanced its transcription. 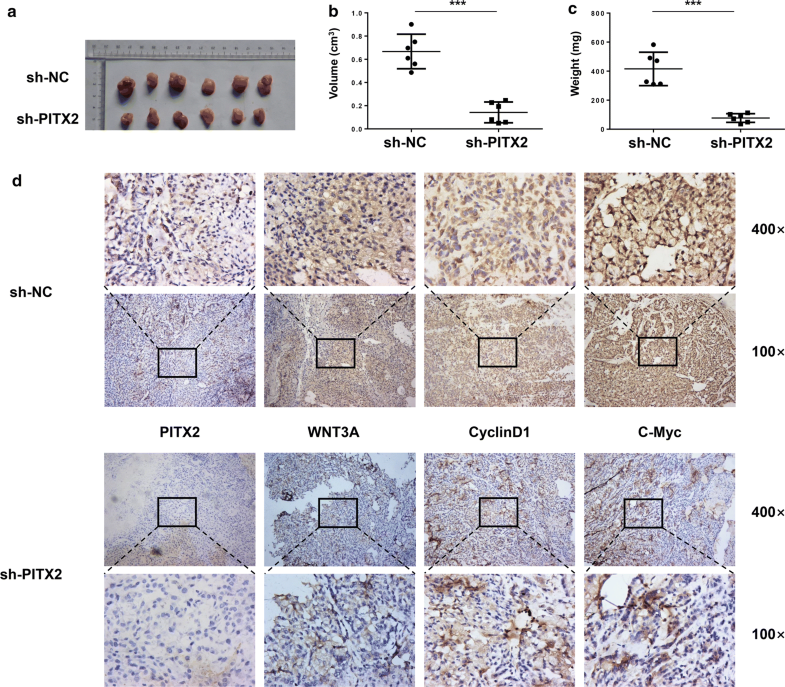 The oncogenic role of PITX2 is relied on its transcription of WNT3A and thus activating Wnt/β-catenin pathway. 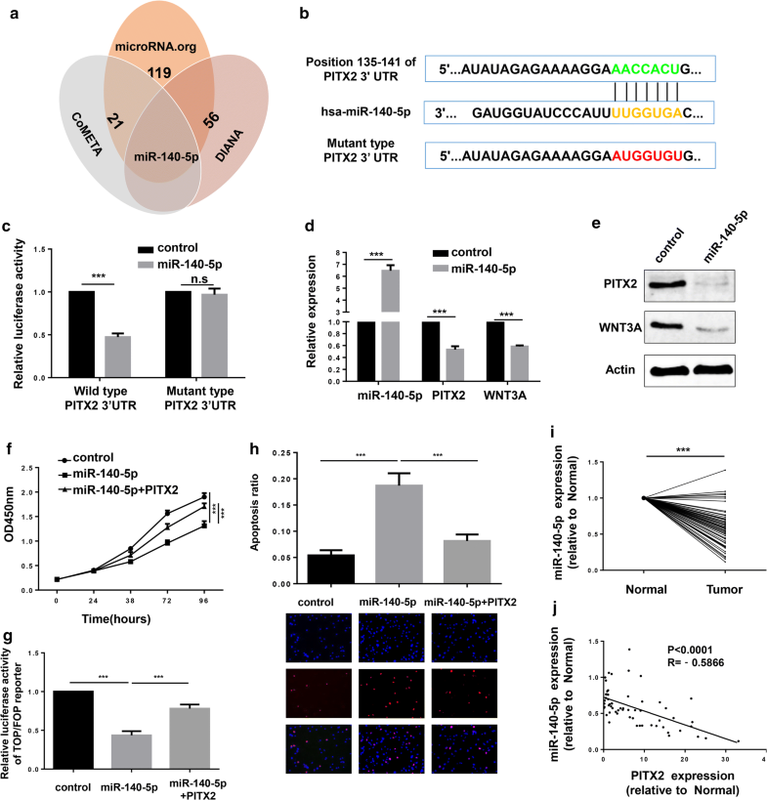 MicroRNAs regulate post-transcriptional gene expression via binding to the 3′UTR of mRNA, and either inhibit protein translation or destabilize target mRNA . Technologies aimed at replacing tumor suppressor miRNA that are lost during cancer progression have emerged as promising cancer therapies . As we have clarified the role of PITX2 in LUAD, to determine the regulatory miRNA of PITX2 is hopefully to provide alternative approach for managing LUAD. Our results revealed that miR-140-5p directly targeted the 3′UTR of PITX2 and suppressed the progression of LUAD. MiR-140-5p has been reported to inhibit progression of many kinds of cancers and regulate the Wnt/β-catenin pathway [69–71]. The miR-140-5p-PITX2-WNT3A axis participates in the regulation of LUAD progression and Wnt/β-catenin pathway, which provides a new sight into the pathogenesis of LUAD. 12935_2019_800_MOESM1_ESM.xlsx Additional file 1: Table S1. 317 genes used for pathway analysis. 12935_2019_800_MOESM2_ESM.xlsx Additional file 2: Table S2. Sequences of qRT-PCR primers. 12935_2019_800_MOESM3_ESM.xlsx Additional file 3: Table S3. Sequences of shRNAs and miRNA mimics. 12935_2019_800_MOESM4_ESM.xlsx Additional file 4: Table S4. Clinical data of 60 LUAD patients.